As I grabbed the first coffee of the day at a trade show last week, I got into conversation with a chap who owns a small sandwich bar in the city. He was there to pick up some ideas for how he could develop his business. Being in the city centre, he’s got a lot of competition, and we talked about how he could differentiate himself. Could he sell better quality sandwiches? Should he concentrate on providing a better service? Or was providing something uniquely tailored to different sections of his customer base more important? It comes from some research work* on ‘value disciplines’ from a few years ago. 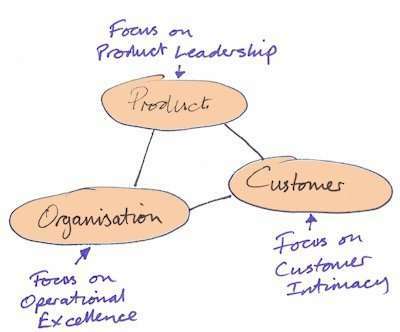 In a nutshell, any business has the elements of product, customer and organisation. For ‘organisation’, you could read ‘process’. And for some businesses, they’ll provide a ‘service’ rather than a ‘product’. The research showed that no company was able to focus simultaneously on all three aspects, and that it was rare for a company to be able to focus on two aspects. Most successful businesses consciously focus on one of these aspects more than the others. Those who focus on customer intimacy pay attention to their customers needs and desires. The product focused companies are constantly innovating and bringing new ideas to market. And the ones that focus on organisation are concerned with making sure that the delivery of their product to the market is as efficient as possible. When working with clients, this is one of the things we often look at as we’re building their marketing strategy with them. Back to the sandwich bar owner. He’ll need to figure out where the focus of his business should be, recognising that he can’t focus on all three values equally. I suspect that he’s not conscious of doing strategic marketing, but he is. Do you know where your focus lies? * The book by Treacy and Wiersema is available on Amazon. I found you on Twitter, nice breakdown on the chart. I have also been studying Strategic Thinking, Strategic Planning and Strategic Management. I am in the process of starting a graphics business and have also compiled my own personal strategies in an E-book I offer at an extremely fair price, see my site if interested. I detail 40 powerful Strategic thinking tactics someone can use on a personal level, then get into planning and managing strategically. With the fast changes in our economy and political policies causing a volatile environment taking a Strategic approach ensures we can keep ahead of the change and deal with change in a dynamic and structured way in our personal and business ventures. Great article 🙂 short and concise.